Step back in time this Saturday at the Malco Summer Drive-In for Soulful Cinema, a feature of “blaxploitation” films from the late 1970s to the early 2000s. Hosted by Black Lodge Video, the Memphis Underground Film Festival and filmmaker Mike McCarthy, Soulful Cinema features “Hustle & Flow,” “Purple Rain,” “Superfly” and “Coffy”. All four movies will play on one screen at 5310 Summer Ave. for $10 beginning at dusk on Saturday. 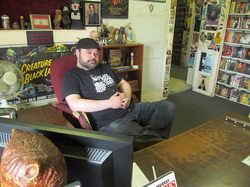 After each movie a short film by local artists will premiere, each with a blaxploitation theme, said Matthew Martin, owner of Black Lodge Video, 831 S. Cooper St.
Blaxploitation is a film genre that emerged in the 1970s that integrated soul and funk music and black culture into films. Soulful Cinema is the first in a series of themed drive-in screenings that will be hosted once a month through Christmas, each with a different theme, Martin said. “We felt this theme would be the best one to start with, especially with the 30-year anniversary of ‘Purple Rain,’ being this year,” Martin said. “And, when ‘Purple Rain,’ came to Memphis, it premiered at the drive-in. The series of upcoming screenings is the result of a test run in October 2013, where a themed group showing of movies sold out. Martin said Malco Movie officials were so impressed with the turn out that they decided to let him host a series of screenings. “Hustle & Flow,” released in 2005 and written and directed by Craig Brewer, stars Terrence Howard. Howard plays a Memphis pimp, Djay, trying to launch a music career during his mid-life crisis. William Blinn and Albert Magnoli wrote “Purple Rain,” which was released in 1984. Directed by Magnoli, the movie follows the rise of stardom and the complications that follow for The Kid, played by music artist Prince. “Superfly,” released in 1972, is about a cocaine dealer who is ready to retire from a life of dealing drugs, but if the mob finds out about his plan it could end in dire consequences. Written by Phillip Fenty and directed by Gordon Parks Jr., the protagonist, Priest, is played by Ron O’Neal. “Coffy,” released in 1973, stars Pam Grier as a nurse turned crime fighter against inner-city drug dealers. The movie was written and directed by Jack Hill.